We are from PA and after a super long engagement are finally ready to begin planning our wedding! 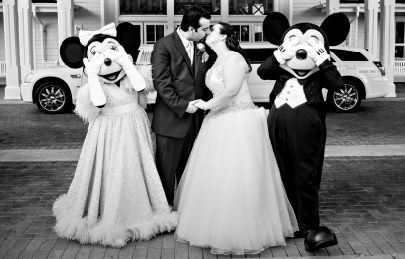 Disney is our top choice, but we are between doing an Escape or Wishes wedding. I know many of our friends will make the trip as they have annual vacations there anyways, but I don't know how far I should go into inviting family. I feel guilty inviting people who I know cannot afford to make the big trip down to Disney, but then I have some people who I would never expect to come telling me that they will be there if they're invited. Ahh I am SO torn! I want to figure this aspect out before we start the rest of our planning as a Wishes wedding is very different from an Escape. We did an Escape wedding because we wanted to keep things small. After talking to Joe's mom, it didn't look like if we had a local wedding that was going to happen - she said 'Aunts, Uncle's and 1st cousins'. When I said 'small' she said 'yeah around 150 people' and my version of small was no more than 80. DH and I regrouped after that conversation and decided neither one of us liked being the center of attention and it would be best to have immediate family only and then if his mom pushed for it we would have done an at home reception. We are both happy we decided to have our wedding the way we did. It was easy to plan and there was not all that much drama (there was plenty of drama on my side with my parents, but that was going to happen regardless). We are from NJ and said the same thing! We invited direct family (grandparents, aunts/uncles/1st cousins) and our wedding party only. We didn't want to get into family friends, college/high school friends or anything like that. Everyone was very understanding of our clear cut off. We were in the same situation. I would have been 100% happy with escape but our families wanted to come so we are doing mini wishes and having 35 people.